In Nepal's Annapurna Conservation Area (aca), the term 'eco-tourism' is not mere conservationist jargon: it's an absolute necessity for the region's inhabitants. For, more than 60 per cent of the backpackers who visit Nepal make their way to the picturesque conservation site. Three tiny airports in the region bring in a tourist throng that, in many years, exceeds the area's local population. It's a challenge that the 100,000-odd people, who reside in the villages within aca, have more than adequately measured up to. At a time when eco-tourism is floundering in most conservation sites in neighbouring India, Nepal's ambitious Annapurna Area Conservation Programme (acap) seems a pleasant contrast. Spread over 7,600 square kilometres, the conservation area is located in Mustang district in northwest Nepal. The majestic Annapurna and Dhaulagiri ranges dominate the protected area's horizon. The ancient Kali Gandaki river threads its way through a primeval gorge in the area that has been the cradle of rich civilisations since 600 bc. The aca is home to more than 1,000 plant species, 101 mammal, 478 bird and 39 reptile species. The elusive snow leopard is the pride of this conservation area; blue sheep, goral, and musk and barking deers are other species found here. And in September, demoiselle cranes fly south from Central Asia along the spectacular Kali Gandaki valley, en-route to their winter homes in the Indian plains. Fragile ecology The villages along the banks of Kali Gandaki are home to the Thakkalis -- a community that dominated the centuries-old salt trade between Nepal and Tibet. Today, tourism is the mainstay of the local economy: lodges and small shops cater to backpackers, and many local people find employment as porters and guides. Livestock husbandry and agriculture are other means of sustenance. People in the aca grow a rich diversity of crops including local varieties of wheat, barley, buckwheat and maize in terraced fields fed by the silt-rich glacial waters. A rough bridle path, on which only ponies and mules can ply with comfort, is this fragile mountainous region's only contact with lower Nepal. Uncontrolled development would have spelt sure disaster here. So in 1986, the Kathmandu-based non-profit organisation, King Mahendra Trust for Nature Conservation initiated the acap: a conservation programme that also empowers people. acap officials work in tandem with the region's 55 village development committees (vdcs). Conservation and management committees (camcs) in each village -- consisting of the vdc chairperson, representatives of each ward within a vdc, five people nominated by villagers and local representatives of non-governmental organisations working in the area -- coordinate this interaction. All decision-making authority is vested with the vdcs; the acap workers have only an advisory role. Good work ACA's clean streets are welcome contrast to the litter-strewn roads of most Indian trekking destinations. Residents of the villages in the aca have evolved a sophisticated system to manage garbage. While biodegradable waste is composted in kitchen gardens, tins are battered into plates by locally paid employees and transported on mules to factories in the plains. Cardboard-cartons are transported to the plains in a similar manner. Beer bottles are sold to local distilleries. Plastic wastes, however, have to be incinerated, for lack of other options. The acap has provided stone-lined incinerators in and around each village for the purpose. 'Mother's groups' -- women's committees -- in each village have regular clean-up drives every month, to collect and properly dispose off any stray rubbish. Mineral water bottles used by the trekkers have always been a waste management nightmare in the area. This problem was solved, to an extent, by establishment of safe drinking water stations in every village along the aca trekking area. Today, backpackers can buy water ionised at these stations at half the price of mineral water. The proceeds go into the village fund for local development activities. High fuel wood demand had led to the degradation of much forestland in the aca in the 1970s. This was checked to some extent after the acap took root. Kerosene depots have been established all over the aca; the villagers can source kerosene for Nepali Rs 55 (us $ .75) T his works out cheaper than collecting wood from the hill forests for which porters have to be hired. Besides, most lodges are equipped with solar panels for water-heating: the acap offers a 50 per cent subsidy on these panels. In households that still rely on wood, an interesting device has been added to the wood stoves: a metal water pipe, that runs through the fuel chambers of these stoves, facilitates simultaneous heating. Micro-hydel power units are also in vogue. For example, Ghandruk village has a 25 megawatt plant, operated and run by the villagers. Lodge owners here pay the double the costs for electricity, if that's their preferred means to cook or heat water. Lodges are very often extensions of local homes. Reasonably priced home-cooked local delicacies and all primary amenities required by a trekker -- including the typically alluring hot water shower -- make stays in these rest houses a pleasure. All lodge owners are members of village-based tourism management committees, which ensure -- among other things -- that the food rates are standardised. Besides, the acap conducts frequent lodge management courses, it also organises cooking, and even English-speaking, classes for lodge owners. Women are the mainstay of aca's economy. Some women lodge owners of Jomson village told me a little jocularly: "There are 'Fathers' groups', but most don't undertake any activity". Mothers' groups are, in contrast, very active. In Jomson, I met members of one such group who had just finished a ticketed cultural programme, the proceeds of which would be used to establish a children's library. The women told me that family planning was quite common compared to the pre acap -times. They also related proudly that almost every child in the area attends school. Watching dozens of children troop back from school, I realised that the security of livelihood and basic household needs has allowed women to think seriously about local environmental and cultural concerns. Much credit for this goes to the acap. The programme gives local people loans to start lodges, shops and nurseries; it has started day-care centres for children -- relieving women for developmental work -- and has equipped every village in the region with several water taps: these source water from glacier-melt through extremely well-maintained stone canals. Women do not have to bother about their next pot of water: quite a remarkable achievement for a remote area such as the aca. "When acap commenced, it was decided that 60 per cent of revenues collected from tourist permits would be channeled into vdcs after ten years of the project. The promise has not been kept, and this has lead to disillusionment with acap in the villages," says Chandra Gurung of the W orldwide Fund for Nature, Nepal. He feels that the local people are also chaffed because they have very little presence in acap's high echelons . "S uch formal involvement is necessary if the acap is to take deep roots in the region," he contends. Besides in some villages, the Maoists have destroyed project infrastructure during the last few years. On their part, acap personnel say that forest conservation activities still require enormous catching up. Eroded slopes near some of the larger townships are sure signs of over-grazing, they contend. And wildlife sightings are at a premium around the larger villages, possibly due to hunting and deforestation. However, they also believe that in recent times, the vdc s have become more active in forest conservation. Most decisions on forests are referred to the camc s and punitive action is taken against villagers who cut trees without permission. Besides, the vdcs meticulously examine every request for renovation of houses that use local timber. But trees continue to be cut for fuel wood. One way out is to tap the strong winds, that hustle through the area throughout the year, for energy. This can go a long way in reducing fuel wood dependency. But the vdcs have not given much attention to this sector. The local community has other pressing problems at hand. 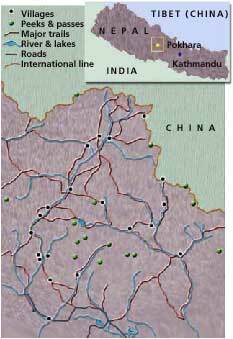 Amongst them is the broadening of most of the Annapurna circuit route from the town of Pokhara to the Tibetian border. On the one hand, this has worried some local people that the traffic of heavy vehicles and the ensuing pollution will drive off the backpacker. On the other, people have already started purchasing motorbikes and some have invested in tractors. It's quite likely that raucous motor horns will soon replace the charming jangle of the mule-bells. However, Lizan Maskey, acap 's conservation officer at Jomson, is optimistic: he hopes that new trekking routes will be opened in the higher reaches of the aca. "So, aca will continue to draw tourists, albeit more for attractions such as skiing and mountaineering," he says. Also, there is strong support for road development amongst most villagers in the entire area, as they depend almost completely on lower Nepal for most commodities. Over the past few years, another problem has bedeviled aca. The Maoist insurgency in Nepal, and the declaration of nation-wide emergency in early 2005, has adversely affected the tourist inflow. Tourist numbers were down to 42,347 in the year 2004 from a high of 76,407 in 2000. But people are optimistically hanging on in the hope that the political situation will take a turn for the better. Until then, their ingenuity at managing their precarious economy will be constantly challenged.